It’s the day I wait for all fall…that third frost that tells me my collard greens are sweet enough to harvest from the garden. 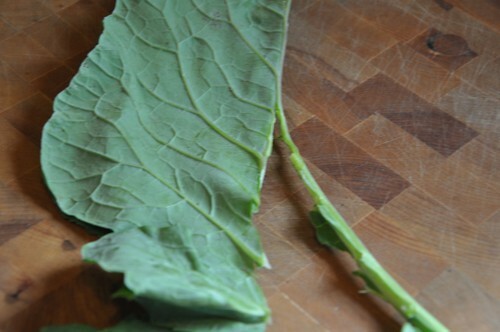 It may be an old wives tale, but I never pick collards unless they have been frosted on three times. 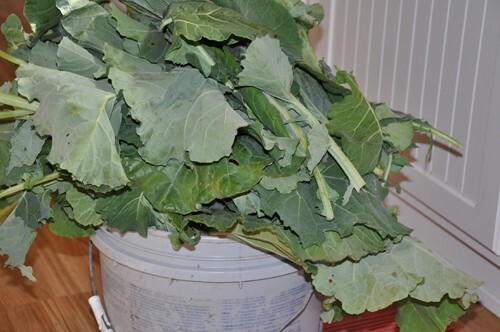 With our unexpected snowfall last weekend, I was ready to spend a few hours this week cooking up a big batch of collards. I like to cook them all at once and then freeze them so I can enjoy them all winter long. 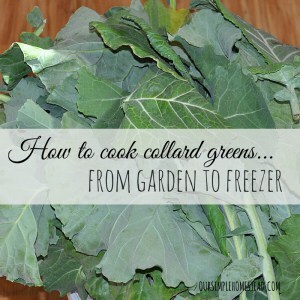 There are a dozen different ways to cook collards, but I have found my family likes them a bit sweet with a touch of bite. It is one of those vegetables that you either love or hate, but I can always count on my family getting a good dose of vitamins when I cook up a batch of my favorite fall greens. Step #1 – Wait until they have been frosted on three times. This takes the bitterness out and leaves them sweet and ready to harvest. 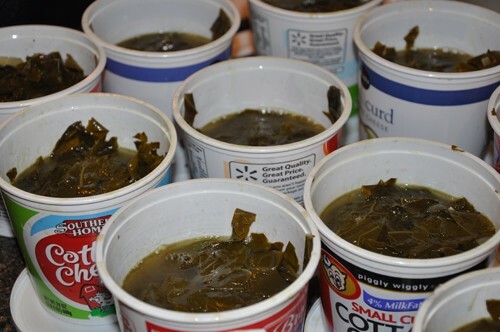 Step #2 – This recipe calls for a five-gallon bucket filled overflowing with collard greens. 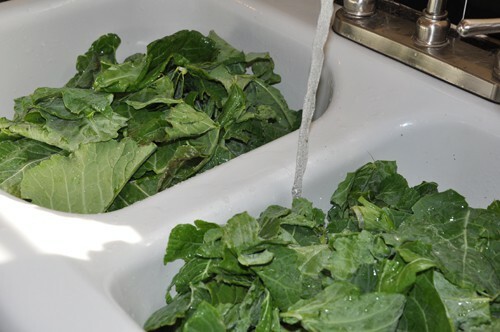 Step #3 – Wash the leaves 2-3 times in cold water to make sure all dirt and sand is washed from their leaves. Step #4 – Remove the center stem by folding the leave in half and pulling off the hard stem. 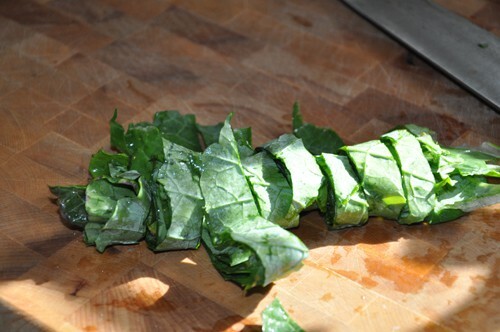 Step #5 – Layer 4 to 5 leaves together, roll them and slice into 1/2″ pieces. 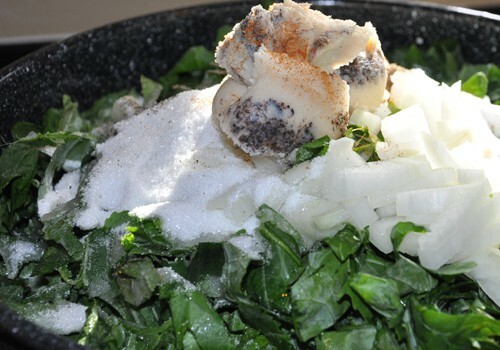 Step #6 – In an extra large kettle add sliced collard greens and all the ingredients found below in the recipe. 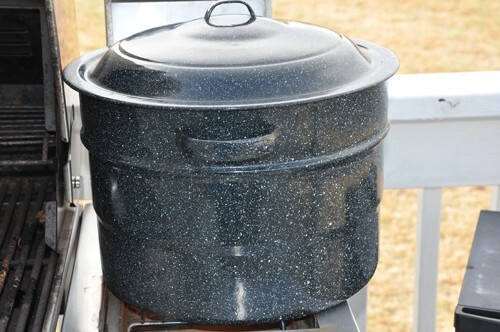 Step #7 – If possible, cook your collard greens outside to keep your house from smelling like cabbage. 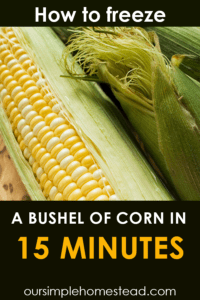 Bring to a boil and then simmer for 3 hours or until tender. 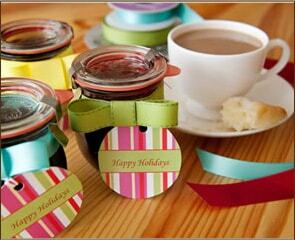 Step #8 – After they’ve cooled, separate and freeze in individual containers. 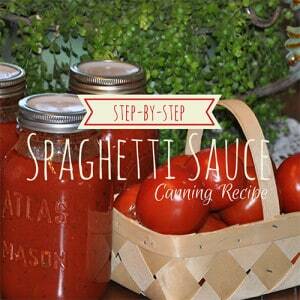 Step #9 – Enjoy all winter long! 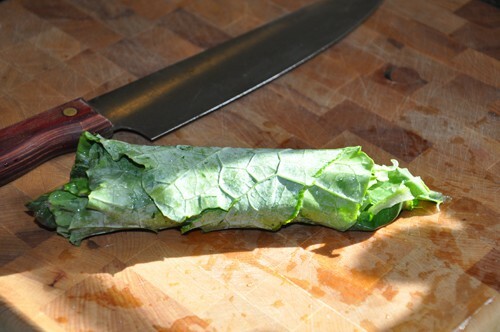 Does your family like collard greens, what is your favorite way to cook them? 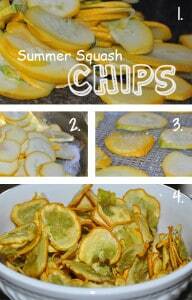 Wash, remove stems, and slice into 1/2" pieces. Chop onion and add all ingredients to a very large kettle. 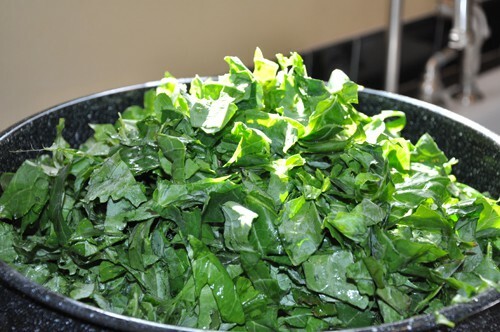 Reduce heat to a simmer and cook for three hours or until greens are tender. 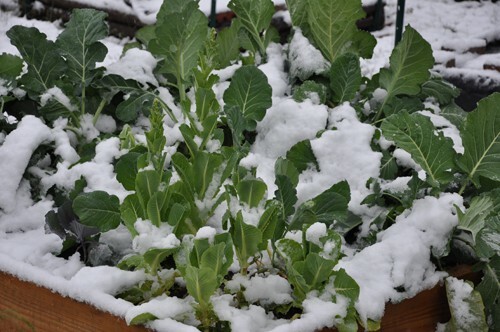 If you are freezing let greens cool before separating into individual containers. PreviousHow many calories do you burn doing housework? I’ve never had collards, but my friend grows them for market. I will have to tell him about picking them after they’ve frosted 3 times, if we get that much frost! Thanks for sharing you post on this week’s Maple Hill Hop! 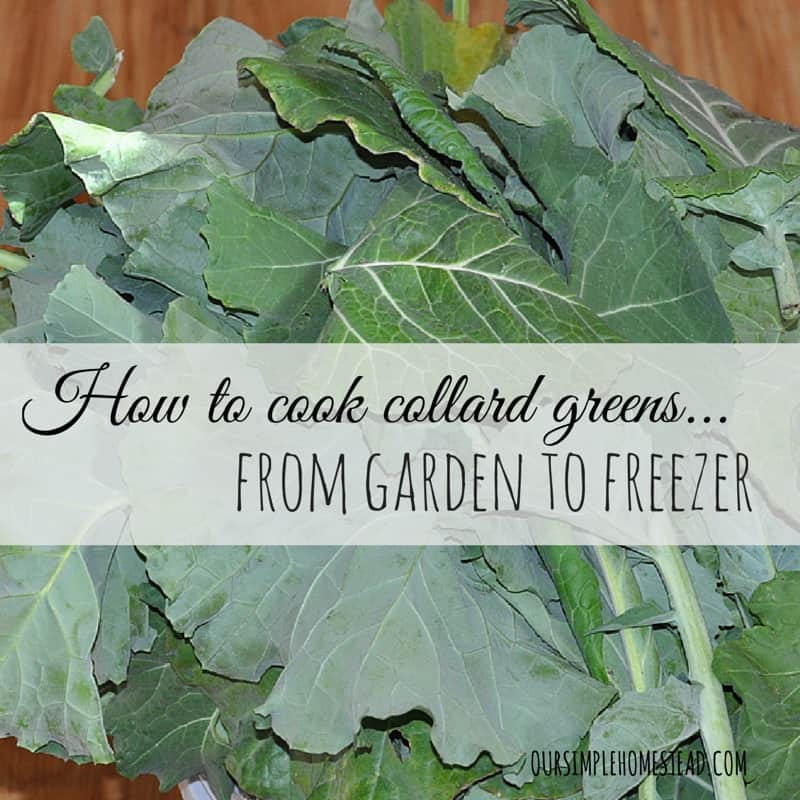 I learned that trick from my Grandpa…he would never pick collards unless they got frosted first! Collards are a FAV in our house! 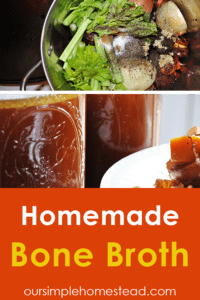 We love them with chicken broth and ham hocks. We will have to try them with apple juice. 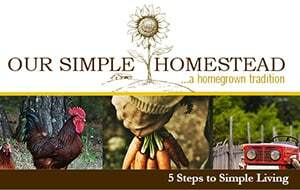 Thanks for sharing on Homestead Blog Hop. Thanks so much for linking up with Green Thumb Thursday last week! Great post….in fact, I chose it as my featured post! Stop by and grab a featured button for your blog, and link u again this week! 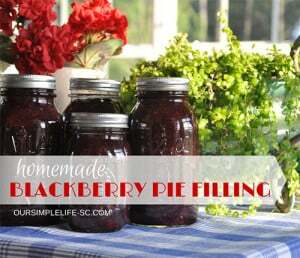 BJ I have made smaller batches and just cut everything down to 1/4 of the amount in the recipe. This recipe sounds very tasty. 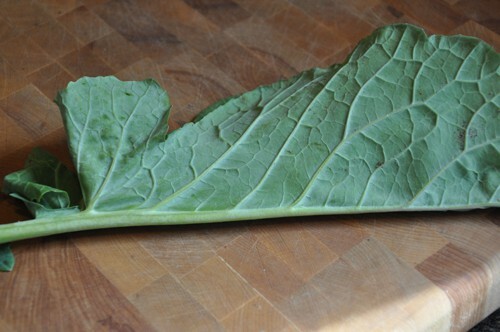 I cook and freeze collards that I grow also. 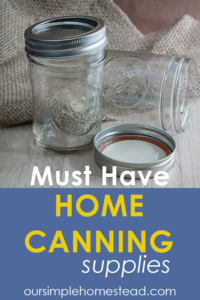 I freeze in canning jars also. 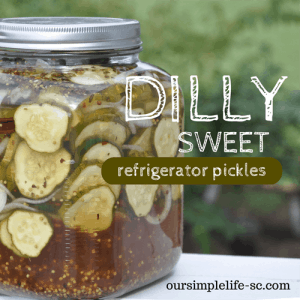 How long can you store them in the freezer? Emily I have kept them for up to four or five months. We love them so much they don’t last too long at my house.